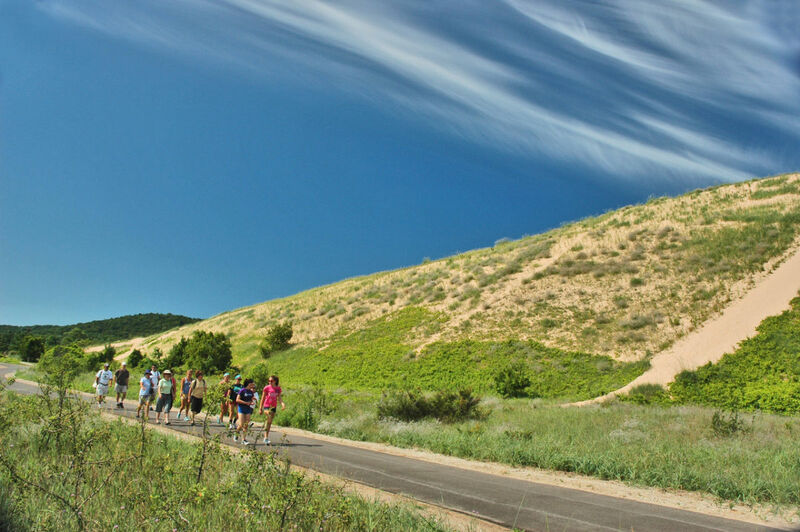 This paved multi-use trail passes through Sleeping Bear Dunes National Lakeshore. The 5-mile 'Dune Climb to Glen Arbor' portion of the trail officially opened with a formal ribbon-cutting on June 20, 2012. The trail head for this popular section is located north of Empire on M-109. Since 2012, four additional trail sections have opened. The trail now runs for almost 22 miles from Empire to County Road 669. There are eight trail heads that provide access. Most of the trail is asphalt, but a 3-mile section in the Port Oneida Rural Historic District is crushed rock. When complete, the trail will run for 27 miles from the northern end of Sleeping Bear Dunes National Lakeshore, where M-22 and County Road 651 meet, to a point just south of Empire on Manning Road. Stop by the Traverse City Tourism Visitor Center for a printed map or download a map from Michigan Trails Maps for a small fee.